The animals are woken up by the sound of gunfire, though Mrs Hedgehog initially believes that it is her husband’s snoring! It turns out that the animals are on land used for army practice. 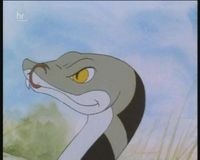 The Rabbits panic and head for the road, but Adder manages to halt them. Weasel tries to imitate a soldier’s activities by attacking a nest of wasps, but soon regrets it when she gets stung on the nose. However the presence of the wasps causes the soldiers to abandon their practice, making it safe for the animals to come out for water. As the faster animals have now stopped to wait, Mole goes digging for more worms. 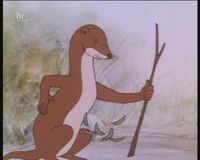 Weasel suddenly smells smoke. Pretty soon there is a red glow in the sky, coming from the direction the animals have travelled. A fire is quickly spreading through the dry grass. 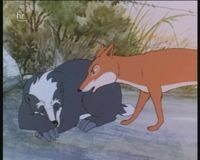 Panic quickly spreads through the group and their natural instinct is to run, but Badger insists they must wait for the slowest animals to arrive. Mole is also now missing, eating worms completely unaware of the danger he is in. 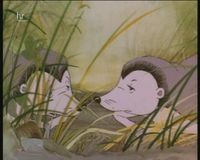 The smaller animals and Adder arrive, but with the smoke decending on them, the animals are forced to move on without Mole, Fox and Toad. One of the baby rabbits asks his mother if they will ever see Fox again. Mrs Rabbit replies that Fox can run faster than fire itself. Fox makes his way through the flames and rescues Toad. The other animals have arrived by a lake and are delighted to see Fox and Toad coming out of the smoke. They are all now safe apart from Mole. After a short rest the animals find the fire is getting close and they are forced to wade across a causeway to an island in the middle of the lake, where the flames cannot reach them. Fortunately by now firefighters have arrived on the scene to tackle the blaze. The animals wonder what has become of the Newts they left behind. The firefighters are winning and the fire is nearly out. Unknown to his friends, Mole has been rescued by a firefighter. He is suddenly spotted by Fox who makes a dash to rescue him, with help from Owl and Kestrel. It begins to rain and thunder. Reunited on the island the animals prepare to begin the next stage of their journey. Whatever happens, says Fox, now that we are together, let’s stick together!